The review found SBA loans made from 2002 to 2009 to operators of three franchise brands—Planet Beach, Petland, and Cold Stone Creamery—defaulted at rates above 46 percent. In that period, almost 1,000 SBA loans totaling $199 million went to these three franchises. More than half of them defaulted, costing the SBA $39 million in guarantees. 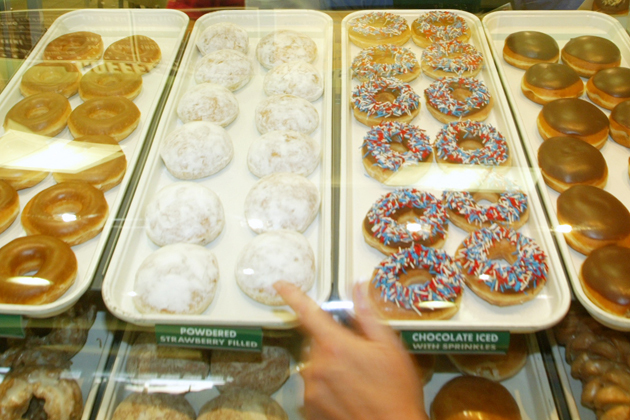 A Krispy Kreme store in Beaverton, Ore.
Buying a franchise business, even when your loan is backstopped by the federal government, is riskier than you might think. The latest evidence: More than 40 percent of buyers of a single franchise defaulted on the loans that the Small Business Administration guaranteed over a dozen years. The failures left buyers in bankruptcy and taxpayers on the hook for $11 million, according to a new report by a congressional watchdog. It’s not just one problematic franchise system, either: The SBA paid out after borrowers defaulted in 28 percent of all the franchise loans it approved from 2003 to 2012, costing the agency $1.5 billion, according to the report, published on Wednesday by the Government Accountability Office. The GAO doesn’t identify the franchise or the four lenders who were responsible for most of the bad loans. The agency’s protocol is to withhold the names of companies reviewed in its work, says GAO spokesman Chuck Young. 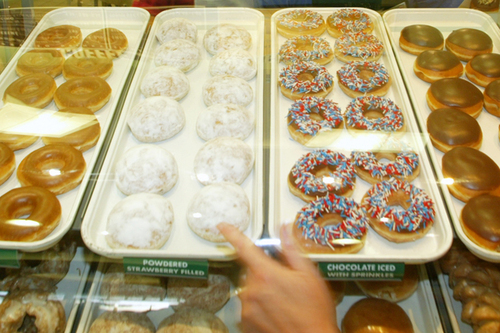 The SBA approved 170 loans totaling $38 million from 2000 to 2011 to buyers of this franchise. Of those, 74 defaulted. Most of the failing loans were originated by just four lenders. SBA loans they made ended in default more often than not, the report shows. During the 18-month audit, GAO staff interviewed 22 franchisees, including 16 who defaulted and 10 who filed for bankruptcy. “Franchisees we interviewed noted difficulties meeting anticipated revenue estimates,” the report says. The report also looked at claims that a loan agent inflated projected sales of the franchise to get the loans approved. Congressional auditors interviewed the loan agent (also not named in the report) and were “unable to conclusively determine” whether she pumped up revenue numbers to make the deals look less risky. The SBA barred the agent from doing business with the agency for three years, starting in 2012, “for encouraging false statements,” the report notes. The SBA approved more than $28 billion (PDF) in financing last year. The bulk of that was through its program known as 7(a), which offers entrepreneurs loans of as much as $5 million, originated by banks and other private lenders. The SBA guarantees up to 85 percent of the loan’s value, giving lenders a backstop against losses on loans to entrepreneurs who might not otherwise qualify for private loans where banks bear all the risk. The GAO’s report is the latest in a series of watchdog warnings about lax oversight of SBA loan programs. In July the SBA’s inspector general found that the agency “had not implemented a program or process to effectively monitor risk in its loan portfolio.” The review found SBA loans made from 2002 to 2009 to operators of three franchise brands—Planet Beach, Petland, and Cold Stone Creamery—defaulted at rates above 46 percent. In that period, almost 1,000 SBA loans totaling $199 million went to these three franchises. More than half of them defaulted, costing the SBA $39 million in guarantees. Despite that record, the SBA continued approving loans to those franchises. The inspector general’s report notes that “these are simply examples of the type of risk that could be identified,” not a comprehensive list. Inflated revenue projections aren’t a new allegation. A 2011 inspector general report found that “Banco Popular (BPOP) used unrealistic revenue projections” in underwriting loans to buyers of Huntington Learning Center franchises. The cost to taxpayers for 12 defaults: $2.1 million, according to the inspector general. Other loan programs have faced scrutiny as well. In September a GAO report (PDF) found that the SBA’s Patriot Express loan program, intended to speed loans to veterans, has cost taxpayers $31 million since 2007 because of high defaults. An SBA spokeswoman e-mailed on Wednesday evening did not immediately have a comment on the report. The SBA has been without a permanent leader since August, when former Administrator Karen Mills stepped down. Acting Administrator Jeanne Hulit, a former executive at Citizens Bank (RBS) and KeyBank (KEY), previously oversaw SBA’s loan programs, according to her biography on the SBA’s website. President Obama has yet to appoint a permanent successor to Mills.